The idea of transformation, of renewal and metamorphosis is the backstory behind Loren Nelson‘s beautiful series Under Wraps. In the worst weather in the Pacific Northwest, he takes a large format camera into the elements and captures the fleeting moment of change. 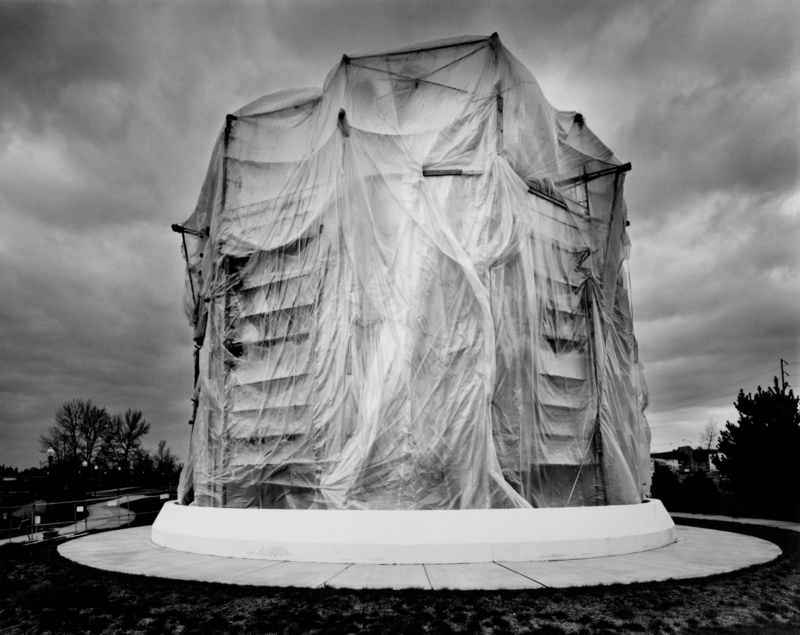 Focusing his lens on the amorphous architecture hidden under the plastic tarps while the construction continues into short days and inclement weather, Loren finds new life and ways of illuminating the hidden bones of structure. With the approach of spring and better weather, this architecture emerges retooled, reimagined. Loren’s Gelatin Silver prints are perfection. 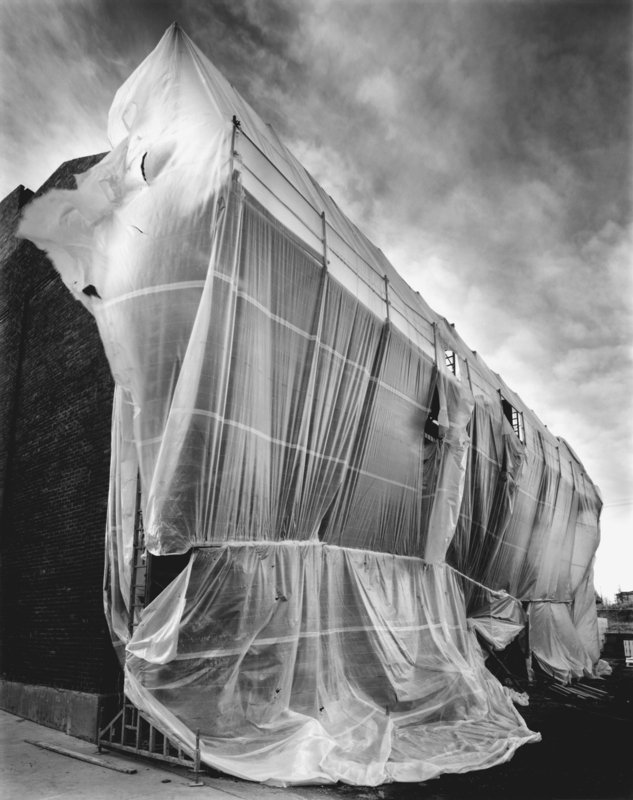 In most instances, bigger isn’t always better, but in the case of Under Wraps, we are thrilled to have in the gallery these luminous pigment prints in a large format, 30×40 inches. 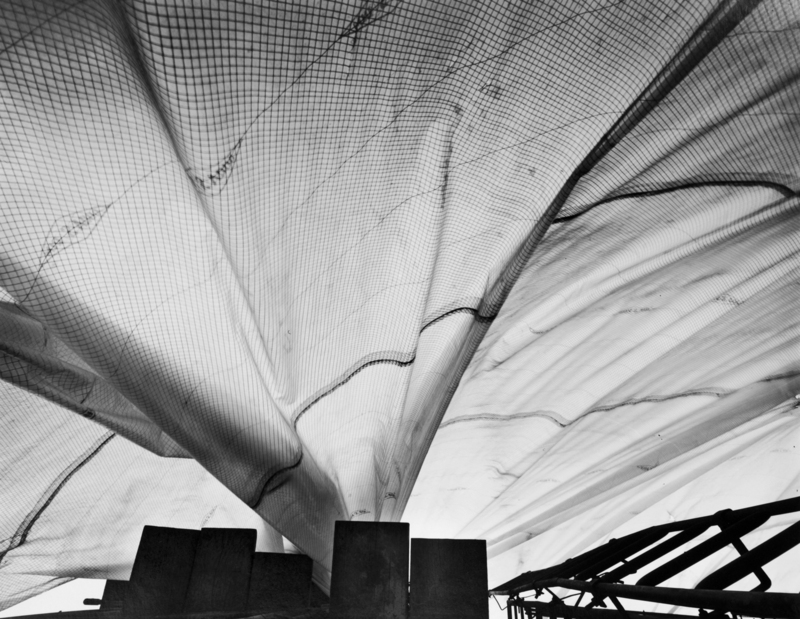 These large scale prints incite us to play in the folds of fabric, of billowing nylon. These prints are engaging and beautiful. Stop in the gallery on Saturday June 14th between 2 – 4pm, we are pleased to have Loren in the gallery to discuss his work and be part of our artist reception for Structure. Born in Colorado Springs, Colorado in 1952, Loren Nelson has always been interested in art and photography. He grew up in a family of artists – his father was a commercial artist and his grandmother, a china painter and teacher. Initially fascinated with color landscape photography, he watched his first good quality black and white print emerge in the developer while studying at the Portland Art Museum Art School in the early 70s. Nelson decided at that moment, that this was his purpose in life. In 1972, he picked up a Deardorff view camera, and has been organizing the world on a four by five-inch piece of frosted glass ever since. 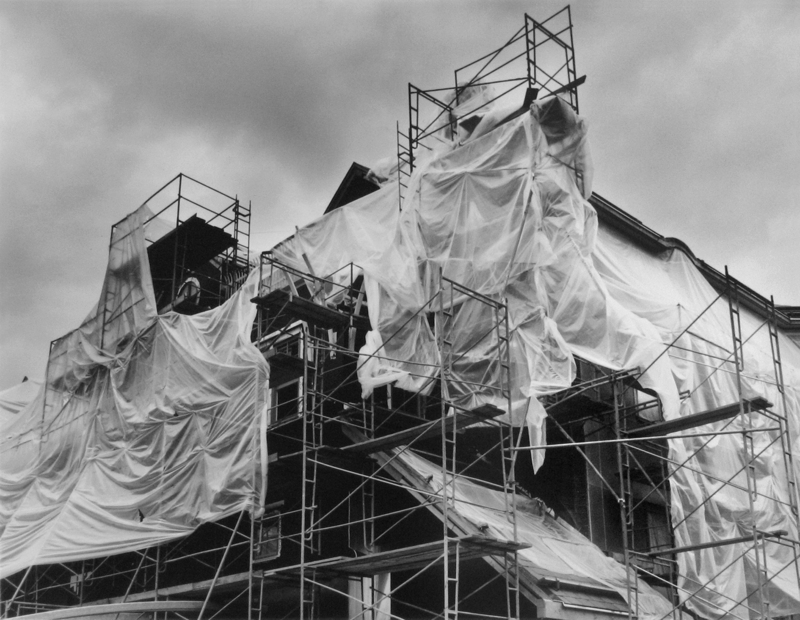 Loren counts as his early influences Minor White and Wynn Bullock, and he holds the contemporary photographs of Bruce Barnbaum, Michael Kenna, and John Wimberley in high regard. He states that, “Each demonstrates technical mastery of his craft, astounding print quality, and a deep connection with his subjects” — qualities Nelson hopes are evident in his work. Nelson’s work has been widely exhibited in the western United States. His photographs are in numerous permanent public and private collections, including IBM, Oregon State University, and The Portland Art Museum. He makes his home in Beaverton, Oregon. 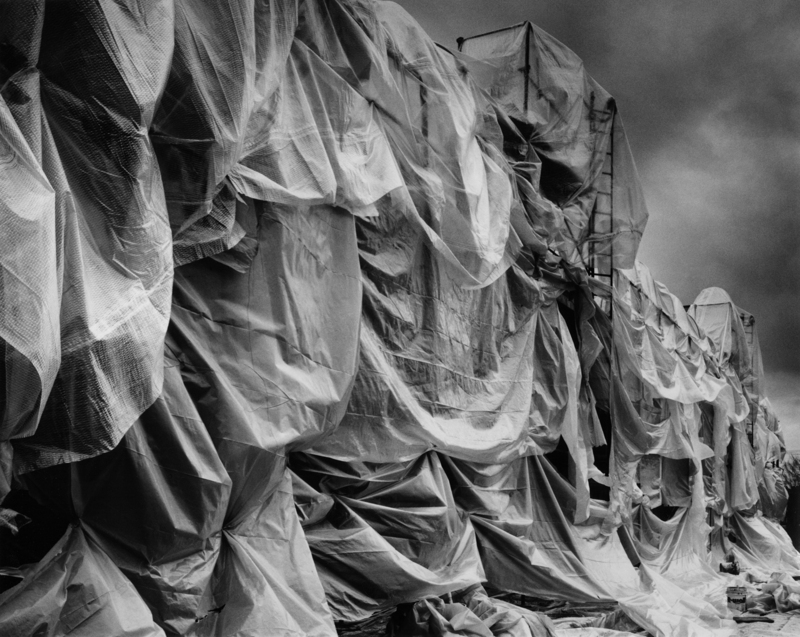 Plastic-covered buildings captivate me with their ethereal, otherworldly appearance. When I spot one, I immediately set a mental timer. 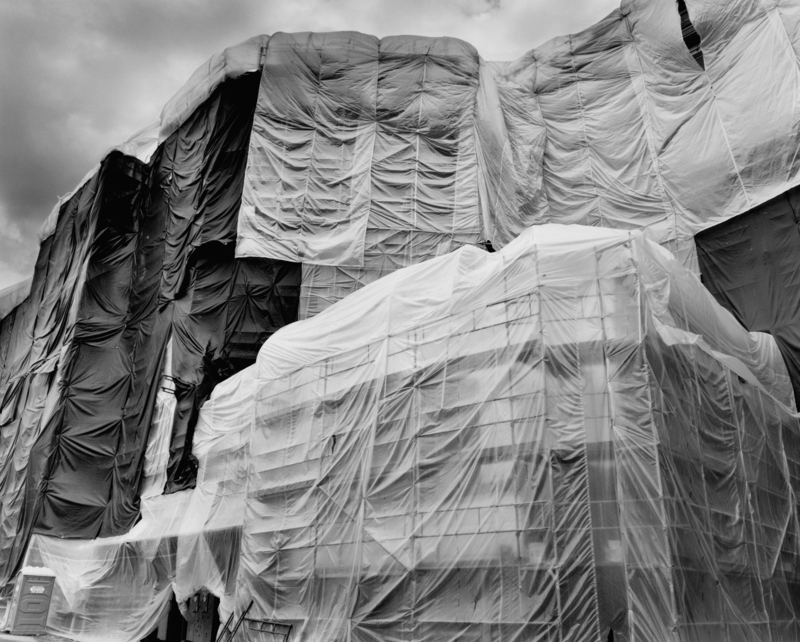 Whether under construction or renovation, they are usually not wrapped for long. I get right to work, obtaining permission to photograph, ordering up dark and foreboding skies, and loading film holders. I work with a Deardorff 4X5 view camera, which slows me down and allows images to present themselves to me. In a meditative, Zen-like state, I am able to sense the moment that light, wind, clouds and glowing plastic all come together in glorious visual harmony. 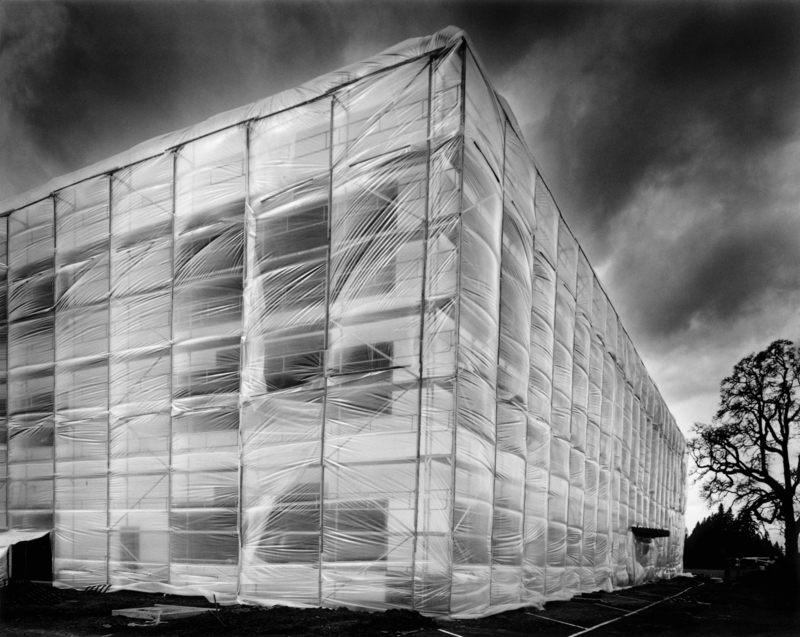 At times, with the breeze billowing the plastic sheeting, the building seems to breathe along with me. Whether a structure is rising anew, undergoing repairs, or getting a fresh coat of paint, we are reminded of our own ability to change our lives, remain structurally sound, and gain new life. For more of Loren Nelson’s work, please stop in the gallery or visit our website for more information.